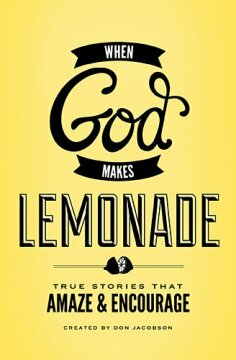 in When God Makes Lemonade, author Don Jacobson has collected stories from the lives of everyday folk. it's a collection of stories about people just like you who have discovered unexpected sweetness in the midst of sour circumstances. these real-life stories all have one thing in common: hope. we've all experienced those "lemons" in our life; out-of-your-control issues with your health, employment, relationships and circumstances that are truly sour. we wouldn't wish these on anyone. but when the lemons become lemonade, oh how refreshing! i absolutely loved this book. as soon as i read the first story, i knew it was going to be a great one. each chapter has a very touching personal story, an encouraging outcome and all the glory given to God. some of the stories made me laugh and some had tears running down my face. each and every story was truly an encouragement. it is such an inspiration to read of other peoples struggles and how God worked through their lives to change them. this book would be an absolutely wonderful addition to your bookshelf. it would be great to leaf through from time to time for some extra encouragement and bring those tough times in your life into perspective. this book was provided to me free of charge by booksneeze.com in return for my honest review.